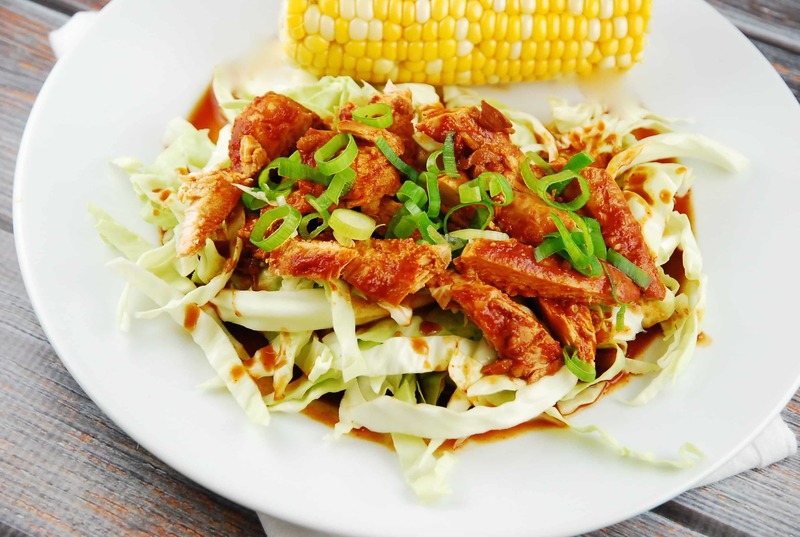 Sweet, spicy, salty…this Weight Watchers chicken recipe has all the flavors you crave, yet is still light enough to be just 5 Points per serving. And the next to nothing prep makes it a breeze to prepare. Whisk together remaining ingredients in a bowl, and pour over chicken. Made this tonight and it was awesome, however when I used the WW tracker with the recipe builder, it arrived at 9 points per serving rather than 5. Certainly didn’t stop me from eating it but 5 pts vs. 9 pts is a big difference. I made this last week and it was wonderful. I only used about 1/2 the soy (low sodium), shredded the chicken and served it over a steamed mashed sweet potato. The sweetness of the sweet potato really went well with the sauce. I make this all the time and the family loves it!! In fact, we love all of your recipes! Quick question – I am going to make this today but I only have 1 lb. of chicken, do I need to adjust the cook time? Thanks so much!! Loved this! Made it tonight, and I was home a bit late so it was on low for about 8hrs – and it was great! Just the right amount of heat, and I was nervous with so much sriracha. I served with brown rice and red cabbage. Addictive! Can I make this faster on high heat or no? Kinda new to the crock pot. High heat works just the same as low heat. When you don’t have the 6-8 hours to cook something on low, high heat can work in just 4 hours. Beast of luck! This looks great! I can’t see any way to pin it. Would love to save it for future reference. Looks yummy! don’t have a crockpot/slow cooker might try just cooking the sauce a bit for chicken use.